Passengers aboard the Safari Explorer sprinted from stem to stern, up to the wheelhouse, and onto the top deck to spot humpback whales. 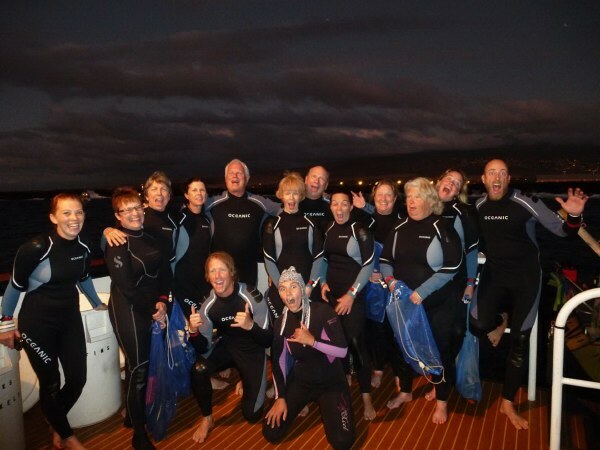 The giants had arrived in the channel between Maui and Lana’i early this winter season. They had migrated 2,000 miles from the chilly waters of Alaska to give birth to their young in the warm waters of Hawai’i. Playful calves frolicked around docile mothers that curled under with a goodbye wave of a tail. Our captain, who has plied these waters for the past thirty years, said he had never seen such a dramatic display in such numbers. Next day dawned clear and bright. 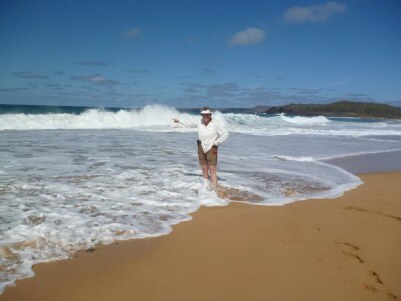 A quick skiff over to Shark Fin Rock off the coast of Lana’i brought us to a perfect snorkel spot. 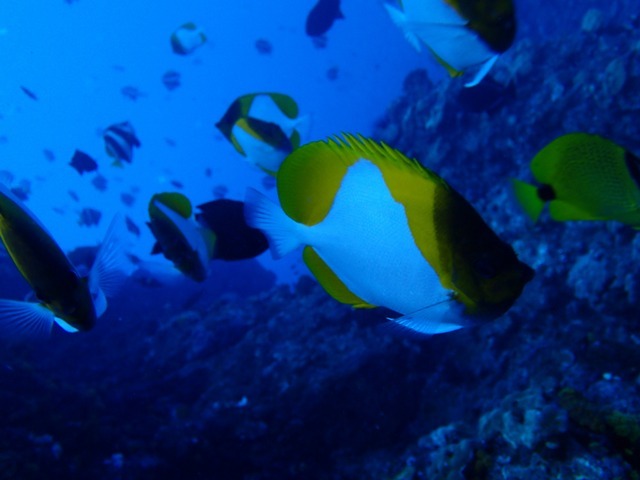 Yellow tang, angel fish, and swarms of small tropical fishes drifted through the water like neon confetti. Strong currents proved to be a workout, and I was thankful for the morning yoga class conducted by a staff member that kept muscles limber after being asleep at the switch for years. Each day began with a hearty breakfast. Food choices were well conceived and delicious. The attentive staff attempts to satisfy everyone’s special dietary needs. I was happy to sample everything offered during the week—prime rib, roast duck, fresh caught ahi and desserts to die for. Our chef gathered fresh fruits and greens at farmers markets while we played away the day. Moloka’i, a 38-mile long island, has resisted development and does not allow big cruise ships in her harbor. 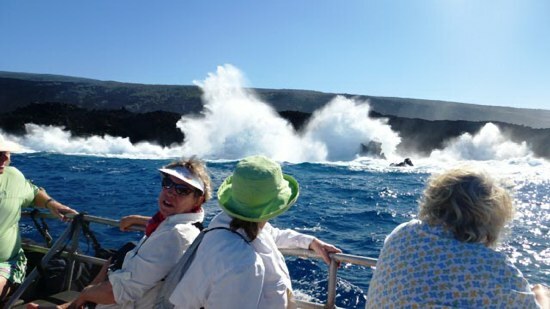 The Safari Explorer, a 150-foot motorized yacht, enjoys an exclusive relationship with the people of Moloka’i. 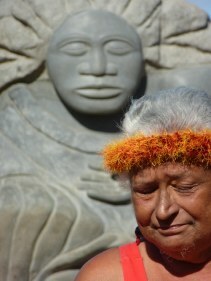 Aunty Snooky talked to us about the power of the old ways while standing in front of a sculpture of Hina, the goddess that looks over the island from her home in the moon. We were invited to an authentic Hawaiian experience at the Moloka’i Museum and Cultural Center where a buffet was spread with samplings of island specialties: shrimp, fresh seaweed, octopus, lua pork, and poi. Our host, a slim and elegant man, played a haunting tune on the nose flute. 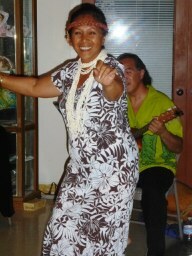 Next, he thumped a big bellied gourd while his sister, a sensuous Hawaiian woman, performed a graceful hula. The west side of Moloka’i boasts a three-mile sweep of deep sand where massive swells crash ashore from a 2,000-mile fetch unbroken by rock or reef. This stop called for a picnic of poki (seasoned raw tuna) and pasta salads. 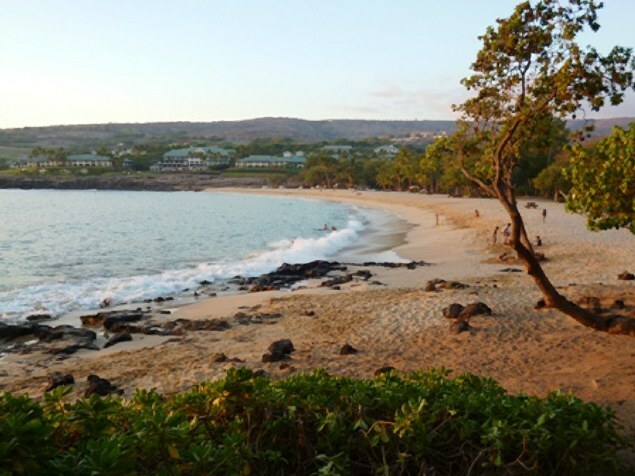 The east side of the island harbors the site of the oldest settlement in the Hawaiian chain dating back to 650 A.D. 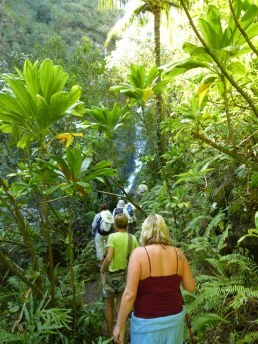 The hike up the verdant Halawa Valley shaded by giant mango trees ensconced in vines took us to a pool fed by a triple-tiered waterfall. Amazingly, our eclectic group moved through the forest with ease. A little assist at two creek crossings by our guides was all that was needed. Some of my fellow adventurers joined me in a dip in the bracing water guarded by the giant lizard named Mo’o. 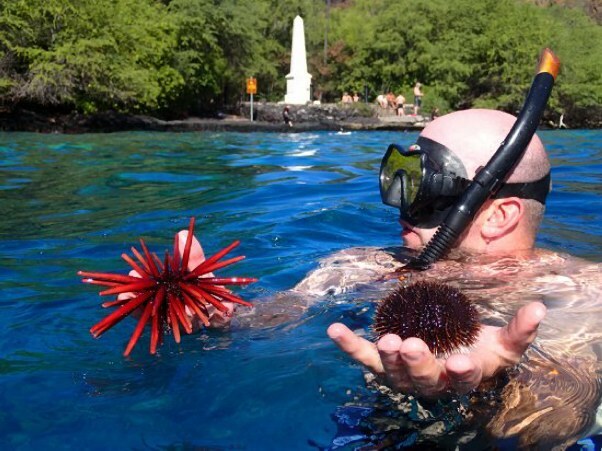 The following day found us blasting across cobalt blue swells to Kealakakua Bay on the Big Island with Captain Zodiac, a local outfitter. The crystalline waters in front of the monument dedicated to Captain James Cook, who met his demise here at the hands of the Hawaiians in 1779, happen to be one of the top ten snorkel spots in the world. We were greeted by a pod of about 100 petite spinner dolphins doing triple-saults and back flips. The colorful array of fishes going about their business in the pristine coral reef don’t seem to mind the daily onslaught of big-foot fish padding overhead. All water sports are weather driven. I hoped to kayak more during my week, but the wind came up on our last day, so we “skiffed” along the rugged coast of the Big Island. Our guide maneuvered us close to active blow holes in the obsidian lava lining the shore. Humongous aquamarine swells crashed white against the cliffs force billowing spray to shoot skyward. Fireworks Hawai’i style! A walking tour of historic Kailua/Kona was in order. Kamehameha the Great, the warrior who united the Hawaiian Islands through conquest, chose the Gold Coast of the Big Island for his retirement. He nurtured the arts during this phase of his rule and gave his people a golden age of peace and prosperity. He reconstructed the Ahu’ena Heiau in front of the King Kamehameha Kona Hotel in 1812-1813. (The present structure is a replica that is one third the size of the original) Inside the hotel is an exhibit of the paintings of Herb Kane, the much-loved Hawaiian artist famous for realistic depictions of the people of old. For a marine life finale we donned wet suits and wore a bracelet with a light on it to attract manta rays—what some would call monsters of the deep. Peering into the gaping mouth of a creature with a fifteen foot wing span was not something I would have sought out, but watching their back bends in a graceful ballet accompanied by circling schools of silvery fish was mesmerizing. After a week, life on the Safari Explorer had settled into comfortable routine. Each morning our expedition leader laid out our plan. Guests shared adventures at the end of the day over a sumptuous meal then fell into comfy bunks lulled to sleep by the roll of the sea. Our “Un-cruise Adventure” was over all too soon. This all-inclusive holiday is a great way to dodge the flocks of snowbirds that migrate to the Islands each winter. A more active, less expensive option is being offered in November. Go to “Un-Cruise Adventures” for details on this, as well as Inside Passage and Sea of Cortez sailings.